Flying Flowers Florist offers free delivery on all orders, standard next day via courier or postal delivery via Royal Mail. Next Day Flowers – Order by 3pm the day before for delivery Mon – Sat. 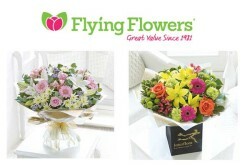 Gifts are hand delivered by expert local Interflora florists.